Need a stylish way to dry all those little baby dishes? Why not give the new Lawn a whirl. 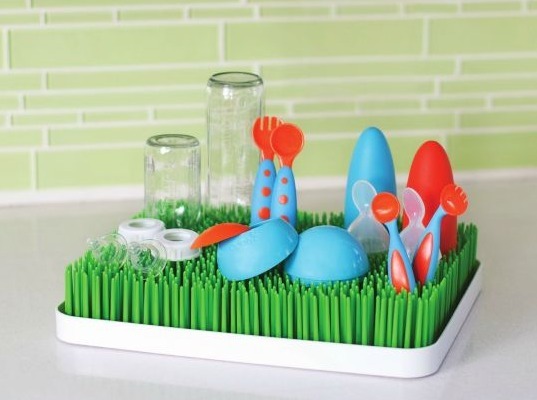 Like the smaller Grass by Boon, Lawn offers an attractive countertop method for drying baby dishes, but with a little more space. The flexible grass blades look fresh and bright, plus holds all your just-washed baby accessories perfectly – even oddly shaped items like pacifiers than fall through the cracks of the average drying rack. Lawn also keeps mold and mildew at bay as excess water shifts to the bottom tray, so sitting water never collects in your baby dishes. The two-piece design is easy-to-clean, and is also BPA-free, phthalate-free and PVC-free.